Be the first to share your favorite memory, photo or story of Derold. This memorial page is dedicated for family, friends and future generations to celebrate the life of their loved one. 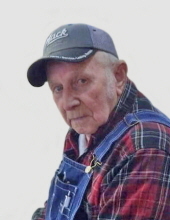 Derold worked as a mechanic for 40 years at Rosen-Novak. Preceded in death by wife, Verlys; parents, Carl and Elsie Pageler; brothers, Donald and Vernon Pageler; sister, Darlene Westergard. Survived by children, Dennis (Barb) Pageler, Carla Buchan, Marcia (Bob) Coffeen; grandchildren: Kim (Mike) Erwin, Chad (Kristine) Buchan, Nicole (Ben) Bolton; brother, Stanley (Mary); many great grandchildren, nieces and nephews. In honor of Derold’s love for the Huskers, please wear red to his service. In lieu of flowers, memorials to the family. Private inurnment at Forest Lawn. To send flowers or a remembrance gift to the family of Derold C. Pageler, please visit our Tribute Store. "Email Address" would like to share the life celebration of Derold C. Pageler. Click on the "link" to go to share a favorite memory or leave a condolence message for the family.